This review is going to be a little aging experiment with two different bottles of the same beer. One was bought in 2008 and one was just bought a few weeks ago in 2009. The 2008 vintage was not properly cellared it was just sitting around the house for a year. But I thought it would be interesting to open it up and compare it to a new 2009 bottle. 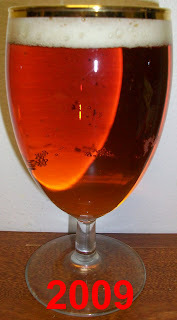 Both beers pour a clear amber with reddish hues and an off white head. The 2008 vintage has a slightly darker head almost almond but not quite tan. 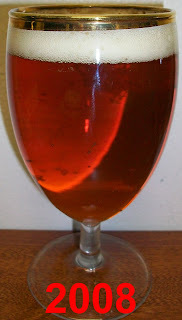 The 2009 beer has much more carbonation with lots of tiny bubbles rising up from the bottom of the glass. 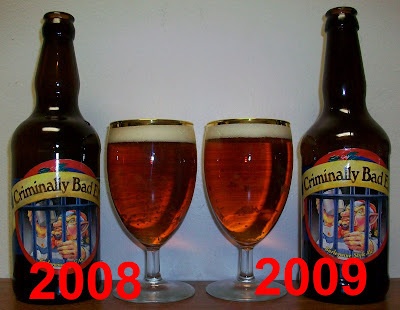 The 2008 beer has noticeable less carbonation, it is not flat but less effervescence than the 2009. The noses on these two beers are really different from each other. The 2009 beer has caramel malts on the nose with a light hop presence and slight citrus aromas. The 2008 has a much richer caramel almost toasted malty aroma with just the slight hint of a floral hop aroma. 2009 has sweet caramel malts upfront then a good carbonation effervescence followed by a slightly hop and dry finish with that classic barelywine dry malt aftertaste. Very nice a classic barelywine style ale. 2008, Wow what a difference. The 2008 one is much maltier with less carbonation. It is also smoother and overall richer tasting. There is no noticeable hop bitterness at all not even in the finish. The finish is smoother with lingering almost toasted or toffee caramel aftertaste. I am really surprised at this, what a cool experiment and quite arbitrary. We did not properly age or cellar the 2008 bottle. It was really just hanging around in my son’s bedroom since last Christmas. It was a stocking stuffer that he forgot about. What you don’t get beer in your Christmas stocking? I guess the Easter Bunny doesn’t leave you beer in your Easter Basket either? OK, back to the review. So let’s take another sip of each. Very nice caramel malts up front then in mid sip you get some effervescence. I really like the classic barelywine characteristics of this beer. Amassing! It is hard to believe that this was the same beer. This is so much smoother and less dry? You do not get that classic dry barelywine finish and aftertaste. This is smoother, almost creamy, with a toasted to almost toffee lingering caramel finish. This going back and forth is not settling well with me. It was an interesting start and comparison but I really need to drink one then the other now. Well, I decided that I like the 2008 better so I am going to finish drinking the 2009 until it is finished and then continue back with the 2008. The 2009 is now at 67 degrees. It is much smoother now and it is less carbonated. It is loosing some of the dry barelywine style finish. It is very smooth and much more malty maltier now. 72 degrees now and there is a slight harshness on the finish but all and all this is still an excellent barelywine. At 58 degrees this is smoother then the 2009 one was at 72. I just can’t get over this beer. I just hope I can obtain the discipline to purposely and properly age some of these beers in the future. I purposely warmed this in the palm of my hand. This is now at 77 degrees. It’s just incredible; the malts are very pronounced now and they are developing a toffee flavor. I am really impressed with this ageing thing. This is one smooth beer with the most wonderful rich caramel malt flavors. I’m nursing the last few sips of this beer; I really don’t want this to end. The last couple of sips were at 78 degrees and fantastic. What a tremendous experiment. The fresh 2009 brew was an excellent classic barelywine ale. The aged 2008 was just phenomenal! I had no idea there would be such a difference in this beer just aged for one year. And the most incredible thing is that this was not properly cellared. This 2008 beer was just lying around the house and sitting on an open shelf in the kitchen for the last few months. So for a letter grade it’s a B+ for the fresh 2009 Criminally Bad Elf barelywine. The 2008 vintage however is a solid A+. Just one fantastic brew but I would no longer call it a barelywine.